Growing up there was one night every so often that we had mustgos. My dad was known for making up words like basquatabus and he is the one who coined this evenings dinner theme. Mustgos aka left overs were not super prevalent in our home with 5 kids. As the older brothers grew up and left home Mom still used the same recipes so low & behold mustgos nights sprung up more frequently. The following recipe is inspired by my dad and all the veggie ends & halves I have stored up this past week. I am amidst a cleanse so veggies are the mainstay of my diet this week. I noticed last night that I just couldn’t get warm and realized that my composition was not agreeing with my eating so much raw food. So today when I was really craving a warm meal I came up with this delightfully tasty salad. You’d be surprised how many recipes you can make up just out of necessity to use what you have! while they are steaming quickly saute the onion in a bit of coconut oil on med-high, stir often. Then chop/shred the peppers & radish. 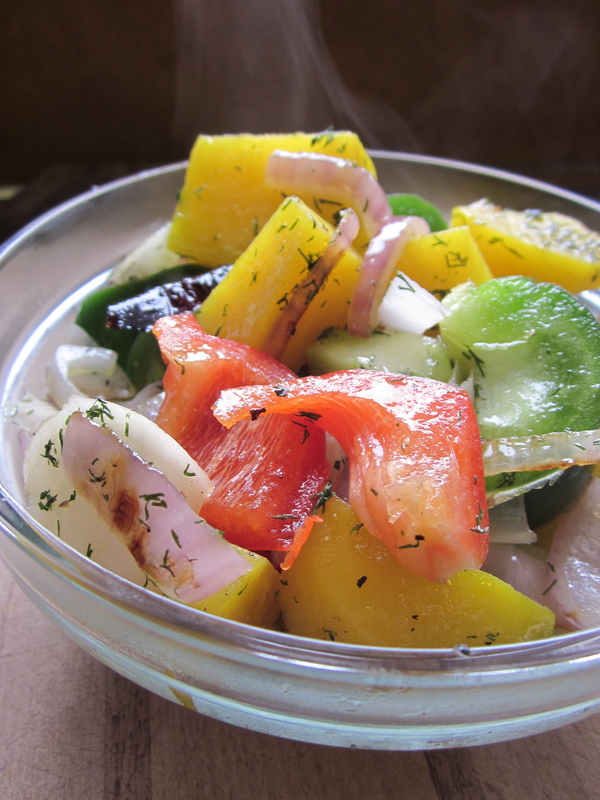 Drizzle olive, dill and s&p on raw veggies, toss in onion & beets when they are done, for a nice colorful, warming salad. Posted in Recipes and tagged dinner, family, health, lunch, nutrition, peppers, recipes. Bookmark the permalink. Cleansing is a personal yearly spring ritual. I am currently on day 6 of a super tasty 2 week cleanse protocol that will be available on April 29th to all who are interested. Modern life, city living and poor food choices throughout the year encourage the build up of toxins in the body. By cleaning up the diet & eating whole foods that are easy to digest for a week plus, the body and its organs get a chance to work at optimal function. Spring cleaning is the result, the ultimate self care ritual! Eating this way is an incredible ally to boosting energy, staying hydrated and feeling great. It is a worthwhile challenge and I sure was put to the ultimate test this weekend. I found that I was actually hungary at different times than the other ladies, so as much as Iove eating as a group, I ate when I was hungry. So when the smells of savory pasta dishes, sausage & maple syrup filled the air I was nice & full. Coincidently there was another women up there who was doing a similar cleanse, so it was helpful to chat with her about the experience and we both shared a pot of ginger tea, while the rest of the ladies where enjoying wine, beer & cocktails. *Sharing with people what I was up to & why was helpful. *I also kept my hands busy and was always chatting with someone, to stay engaged. *Since I was already 4 days into the cleanse my mantra was: I am committed & have already done so much work. *I was so clear headed that the thought of drinking was not appealing. Getting through the weekend finds me here, very proud of myself & wanting to inspire those of you interested in cleansing. The connection between the body & mind during times of cleansing is stronger than ever. There are so many powerful psychological connections we all have to food regarding how & when we eat it. I have found that cleansing is only as limiting if you allow it to be. With a little extra preparation & a great mind set any thing can happen! Posted in Uncategorized and tagged food, healthy snacks, healthy-living, inspiration, nutrition, spring cleaning, spring cleanses, will power. Bookmark the permalink. “you can hold to grief but you have to make room for other stuff too.” a quote from HBOs The Wire. It hit me hard when I heard it last night. I have thought long and hard over the last two years about how to handle the grief the saturated me after my dad died. There are so many levels to the process of dealing with the loss of someone so near and dear. Especially when it happens so quick. Writing about death & grief could and has taken up pages upon pages over history. Though writing is a powerful coping mechanism. This passage here is just a short & sweet appreciation for the initial quote. Grief lives after loosing someone but it can also exist after giving up a habit or cutting out a certain food in your diet. At Seed to Health we explore how to crowd out the old & disserving habits that have developed during life and stock up the enriching, joyful, preventative & healthy elements that this world has to offer each and EVERYone of us.